HFG Architecture believes that the voices of doctors, nurses, and staff should strongly inform the design of medical facilities. While these individuals work tirelessly to provide the best possible care for patients, far too often limitations are folded into the design of a building itself. Only through an extensive process of interviews and dialogues can previously unseen barriers to work flow and patient engagement be identified and eliminated. When designing Hutchinson Regional Medical Center's new Intensive Care Unit, HFG employed its signature Design Charrettes to brainstorm with medical personnel about process improvements. During these interactive sessions, key personnel were provided with paper cutouts representing the square footage needed for each hospital service. Our participants were then encouraged to experiment with how these services could best fit together into a functional whole. The results were spectacular. Based on input from the nursing staff regarding its unmet need to have a visible line of sight to the ICU rooms, HFG furnished a solution that called for a radical departure from standard practice: a circular ICU. This innovative design would allow for increased visibility of ICU patient rooms from the vantage point of nursing stations that curve around the interior of the circular structure. In the finished product, frosted glass affords some degree of privacy while still allowing staff to monitor activity around the perimeter of the circle, from which the patient rooms are accessed. HFG likewise listened to concerns regarding the psychological anxiety patients often feel when undergoing tests in the MRI machine. HFG generated a stunning solution for easing this anxiety. Spanning the ceiling above Hutchinson's MRI machine are illuminated panels displaying the vibrant colors of the beautiful Orion Nebula as captured by the Hubble Space Telescope. This celestial portrait calms patients and allows them to keep their minds at ease. Our prioritization of psychological comfort continues in the outdoor environment surrounding the new ICU. The new facility features a courtyard for use by employees and patients alike. Together with colorful, custom-designed fencing and beautiful landscaping, this courtyard promotes mental wellbeing for those who work or stay at Hutchinson's ICU. By listening to medical professionals who truly understand their own needs, HFG was able to create a facility that better engages the community through improved staff-patient interactions and aesthetics that foster relaxation. For this 36,742 SF project, HFG Architecture designed a new circular Intensive Care Unit, remodeled existing space, and provided upgrades to existing infrastructure throughout the hospital. The decommissioned ICU was torn down to make space for an innovative circular ICU that maximizes the nursing staff's lines of sight to patient rooms. Space adjacent to the new ICU was remodeled to include ICU waiting spaces, vending, and sleep rooms for emergency ambulance drivers. Complex equipment planning was required for the MRI room's Siemens Magnetom Aera 48 coil 1.5 Tesla MRI scanner, which is the most sophisticated magnetic resonance imaging technology available in the surrounding region. 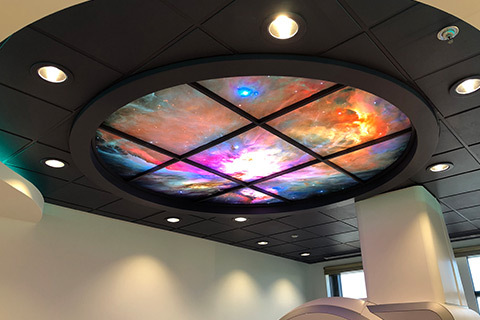 This MRI room also features ceiling panels displaying the colorful Orion Nebula in order to reduce anxiety in patients. Infrastructure upgrades included the separation of a single electrical room into separate control and emergency rooms, an update to the water service entering the hospital, the creation of a dedicated fire pump room, and the relocation of all water softener equipment. A basement remodel updated all laundry services and clean linen storage.